A big thank you to our co-hosts for this month’s posting: Tamara Narayan, Tonja Drecker, Ellen @ The Cynical Sailor, Lauren @ Pensuasion, Stephen Tremp, and Julie Flanders! Don’t forget to visit them and thank them for co-hosting! And we’re revving up IWSG Day to make it more fun and interactive! Every month, we’ll announce a question that members can answer in their IWSG Day post. These questions may prompt you to share advice, insight, a personal experience or story. Include your answer to the question in your IWSG post or let it inspire your post if you are struggling with something to say. My first fictional piece, written in early 2011, was a drabble which is a 100-word story. That first drabble is published on my blog but it’s a bland and mechanical piece of writing. I’m a flash fiction junkie – the shorter the better. For a long time, I thought I’d only be able to write 100 words at a time. I think I convinced myself that I wouldn’t manage more words in one sitting. The thing is, I’d write the 100 words and then edit the piece to death, until I had no energy or inclination to write more words. At that stage, I was enjoying the 100-word stories so much, that I didn’t give myself a chance to think beyond that. Fast forward to July 2016… AND GUESS WHAT? My FIRST CampNaNo and I WON! If you can remember, I always complain about being a slow writer! That’s the main reason I shied away from the challenge. On June 30, I decided to sign up. It wasn’t really planned. The only thing I knew was that I would write a collection of stories. My goal was 500 words a day which equals 15 500 words for the month. I managed a total of 15 607 words. 01st – 541 words…deep breathe and exhale…I have NO IDEA what I’m doing!!! 08th – blank! Not again!! 11th – blank! Not a good idea…what was I thinking…? 12th – 512 words on story number three…it seems to be the one! 15th –blank again! Now what? 16th –blank! Should I give up? No!!!!!! 18th – 607 words…YES!! A BIT BETTER. 24th –blank! OH NO!!! JUST WHEN I WAS ON A ROLL! 28th –blank! NOOOOOOOO! I ONLY HAVE 3 DAYS LEFT! 29th – 1020 words…feeling chuffed! 31st – If I want to win, then I need to write 3 500 odd words in a few hours!? Eeeeeeeeeeek! LORD HELP ME! On the last day, I wrote 3615 words of a brand new story from a set of thirty word prompts. But the writing flowed on the last day! I felt so inspired. It confirmed my belief that I write better from word/picture prompts. CampNano was a great experience, one that I MAY repeat sometime in the future. Coming soon from fellow IWSG member and administrator Lynda R Young! So what happened to your first pieces of writing? What was your first CampNano experience like? If you haven’t done CampNano, why not? I’m so excited for you about CampNano! That is amazing and not easy to do. Congrats! Thank you, Mina! It was a last-minute decision…and you’re right, it’s not easy! Yay for accomplishing NaNo! You rock! I find when I force worddage, it gets ugly. I’m so stoked for Lynda’s book. Congrats on NaNo–Woohoo! You like short (short) stories. You seem perfect for Twitter novels. Yeah, they’re really short. I LOVE short-shorts…the shorter the better. When I write short-shorts, I feel exhilirated! I haven’t heard of the Twitter novel. I must google it. Congrats. I never seem to write much in July. Too busy enjoying the sun. July is winter on my end of the globe. That probably explains my productivity, eh? Wow, that’s a lot of writing in one month. Amazing what you can do when you try. For me, that’s a HUGE amount of writing in one month. Yes, it’s amazing what you can accomplish when you put your mind to it. It is a real skill to write flash fiction. I have tried and failed! I also failed Camp Nano, but I wrote 4k of a 20k novella, so that’s better than 0k! I’ve never written a novella before so this was a new challenge. I always imagine that it’s easier to write flash fiction. I mean, if you can write a 50K novel, then flash fiction should be easy, shouldn’t it? You are one brave Nanowrmo writer! And then you won. That is an award-winning move. Congrats again to Lynda on her new book. Is jumping in at the deep end TOTALLY unprepared an award winning move? Hilary, I know that prompt-writing is the way to go. For me. The last day of CampNaNo just confirmed it. Congratulations! You just proved you could do it. Not every day flows but when the words do, it’s pure bliss. Yep. I proved that I can do it. It feels great! Congrats on Camp NaNo. To set goals and accomplish them takes energy and perseverance. Something we all need in our work. Yes. Working towards a goal is the best way to move forward. And big congratulations to you, Michelle. Bet you’re not as slow a writer as I am. Huge congrats to NaNo! I’ve entered several times but never got through all the way. So you’re a speed demon compared to me. Congrats to Lynda too! Speed demon? Hahaha! No ways. I’m slow. It’s so great when we step out of our box and write more than we could have imagined! Yes! It’s been an eye-opener. It’s amazing what you can do when you really challenge yourself. You’ve never done a NaNo? Really? I never thought I’d do NaNo…not the way I did…jumping in at the deep end on the 01st of July TOTALLY unprepared. You have the skills of an artist and the fortitude of a champion. Congrats and well done. Thank you for the wonderful compliment. Much appreciated. Hooray!! So cool to see you NaNo victory!! And I’ve no doubt your novel is as fantastic as all your short pieces. Congrats to you on Camp NaNo! And congrats to Lynda on her new book! Congratulations on Winning Camp NaNo! Congrats on completing your first NaNo!! It’s a huge accomplishment. I love your journal too on how it came about. So Awesome. 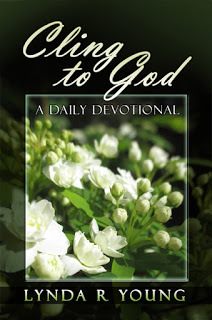 And a HUGE thank you for helping me spread the word about my new up-and-coming devotional. You are so wonderful! Great job on the Camp NaNo! I have some vague plans of writing a bunch of short stories in November for NaNoWriMo. Hopefully, the novel draft will be done by then. IF I attempt the November NaNoWriMo, then it would HAVE to be a whole lot of different stories…about 20 of them. Your recap on how Camp NaNo went is hysterical! Congrats on being a winner!! I am so proud of you, Michelle! You have come such a LONG, LONG way. Give yourself lots of pats on the back. I so admire your drive. UGh. I wish I had it. LOL. My first piece of writing was my MG fantasy. After HUNDREDS of revisions, I still can’t get an agent for it. SOO… maybe another round.WE’ll see. Never did Camp NaNo…. Three A-Z challenges was enough for me… lol. I’m a pantser and can only write when I am pushed to by other…. as in blurbs/taglines, and creative editing. That has been my writing for the past few years…. I did start a PB… we’ll see how that goes. Maybe I’ll work a bit on it today. Just finished reading the New Harry Potter book…. Good, but not Great…. Hang in there with your MG fantasy. Somebody is out there just waiting to connect…as you say, all in good time. You should focus some of your energies on the PB. I’d LOVE to see that. Your artwork is soooo good. Great job on writing all those words and stories. You are an inspiration. Keep going! Huge congrats on getting through the Nano sprint! I love 100-word flash too so I definitely hear you there. It gives you a chance to really hone the craft and then to move on, I think. Where novels are like … when is this ever going to end?? What did I call that character’s first fraternal sibling three chapters ago? Oh, right, they are an only child and I can’t change that now. Happy writing Michelle and thanks for all you do. Happy for your Camp NaNo experience, Michelle. That was a big plus and a large booster for your writing and it’s a good feeling to have. The first time I did NaNo, I didn’t make it through. The second time I made it because I had planned and actually wrote more than fifty thousand words. That’s a book sitting in my computer that I have to work on some day. The third time, I dropped out. That was last year. I had too many things going on and overestimated what I could do, but I love NaNo and maybe this year, I will participate again. Pat, whether you made it through or not, you got words written down that you didn’t have before the NaNo attempts. That’s another way to look at it. Maybe I shall join you folk for another NaNo…just maybe. Way to go with the words! I love your short stuff. Shorts, I think, are the hardest to write. I bet you’re just as good at the longer stuff. Love devotionals. I’ll have to check that out. You’re the second person to say that shorts are the hardest to write. Thanks, Liz! Congratulations on winning Camp! I started participating in 2015, after discovering the local NaNo group in November 2014. I’ve always won, though I tend to write very prolifically very quickly. I’m one of the two overachievers in the group. This July, I set my Camp goal at only 30K, since I’d had a really hard time making 50K in April and in JuNoWriMo. Having a humbler goal actually worked to increase my daily wordcounts, and I ended up getting 60,220 words total during July, more than double the goal I set out for. I didn’t really think that I would be able to write more than 200 words a sitting. I was wrong. You’re so right – all the bits add up. Hi Michelle! I think it’s great that you had such a success at CampNano. It’s great to have that motivation/excuse to write more than usual. That’s why November is high on my calendar each year. Always get a lot done! I have no idea where my first bit of writing is! I wrote a play for the kids in our neighborhood to perform when I was 10. I bet those kids are still not talking to me. Congratulations! You are truly the master of the flash! Your 25 word pieces are proof! I’ll have to tackle that Camp Nano, but I let real life become my excuse for not meeting the goal. Summer is especially hard, but for some reason November it’s different. Hmm! Seasonal? Lynda has accomplished an amazing project! Congratulations! Congratulations, Michelle! I knew you could do it. You are really awesome, you know that right? Congratulations to Lynda. Congratulations on completing your goal. I am like you in that I am inspired to write by photos. It’s a lot harder for me to write and then find a photo for my blog. I found you through the IWSG – I’m #256, In my own words. You words are encouraging. Have a great rest of the weekend. Ah, a kindred soul. 🙂 Thanks for visiting, Diane. Congrats on winning Camp NaNoWriMo! I’m a slow writer as well but I take part in NaNoWriMo (this November will be my 3rd attempt). I’m not in it to win but more to write just as many words I can to work on, flesh out later. I did do Camp NaNoWriMo once but I took part during April which was not a good idea. April is National Poetry Month and I was doing a 30 day poetry project on my blog. And writing 30 poems, 1 a day, for the NaPoWriMo challenge. Plus my laptop charger shorted out and my laptop went dead until the new one was finally delivered. I wasn’t able to get any traction at all. That’s a great way to approach any NaNo…with the aim of writing as many words as possible! I’ve seen the NaPoWriMo challenge. Sounds like something I might try one of these years. But April is the A to Z Challenge too. Thank you for visiting, Lidy! Congrats, Michelle! I’m so proud of you. Turns out it was a lot of fun. I think it’s good to step outside of our comfort zone now and then. fellow “slow writer” I’m so excited for you! I don’t know how you managed with work and all you do for the IWSG. Hope you’ve had time for a well-deserved celebration. Your talent shines through in all that you do! I’m really trying to balance everything. Sometimes it works, other times…? Well, let’s just say I’m still hanging in there!! 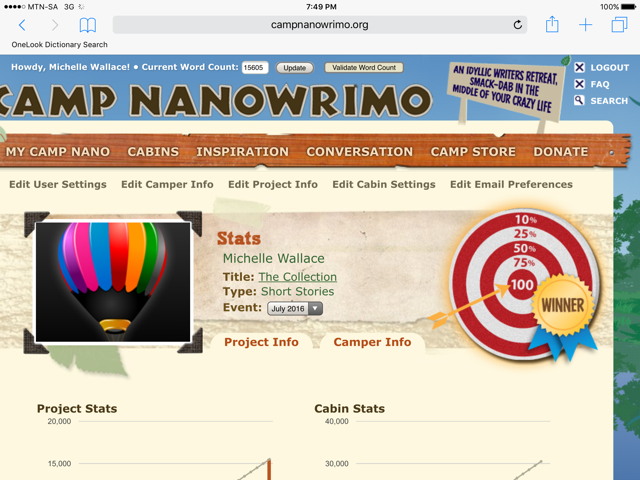 Way to go with Camp NaNo!!! I don’t do short short fiction myself, but I enjoy reading it. I think you’ve found your fictional niche. The stories you write are amazing.